Enemies now starting to appear !!! Have now started to add enemies. Have used the enemy sprites to add a cloud / gun smoke effect with the clouds moving at different speeds - bit like the Asteroids in Fumrye. Have created three enemies - one small plane which travels downwards only - one small plane moving in all eight directions and one large 4 joint sprite plane. Having watched the 1943 arcade video - I realise that I need to add an enemy which travels in a diaganol direction and also enemies which loop the loop to return to the top of the screen. http://www.nes-snes-sprites.com/1943.html which is useful for helping with the overall layout of the sprite - although SEUCK won't allow you to import sprites. 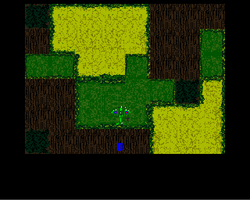 Have now created a couple of enemy sprites and need to think about the attack patterns. This is the key part of the game - if the enemies are too difficult the game play will be non existent. Will take inspiration from 1942 arcade games. 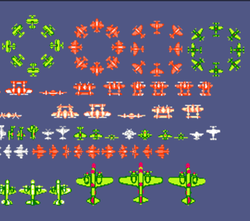 The enemy planes appear to enter the screen in groups of two or four max. 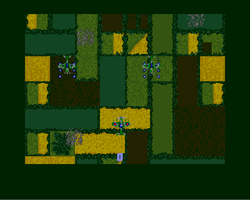 I like the larger plane which enters from the bottom of the screen - if I am to include that I will have to make the larger enemy have a no collision setting with the player's plane. One of the drawbacks of SEUCK (there are more than one) was that the sprite collision was not based on the pixels of the sprites but the whole square area which the sprite is drawn in. To overcome this it makes sense to make the bullets for both the player and enemy to fill the extremes of the sprite box. Was browsing the internet and found this interesting website by John Dell on the Spitefire which contains content he originally created for the Amiga. 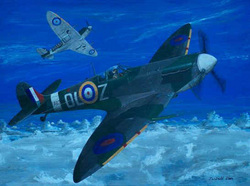 I contacted John and he has kindly allowed me to use the image as a title screen for the Battle of Britain SEUCK game. Just now need to see if I can upload it successfully and that it doesn't exceed the colour limit. He also has an animated spitefire doing a barrell roll which whilst primitive by today's standards is quite impressive when considering the Amiga's hardware - click on the link below to see the animation. 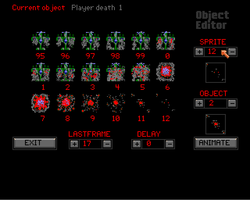 Video of Player Death Sequence. Just finished the death routine. 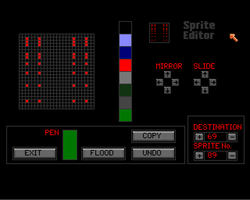 The routine uses all 16 frames available. I had originally thought about doing an animation where the plane plumets to the ground, cork screwing as it falls with a tail of smoke. I might have a go with trying to implement this for the enemy planes - or perhaps have non interactive british planes occassionally entering the screen as falling comrades. Have also managed to improve the propellor animation slightly!! After a period of mourning I have decided to start the game from scratch - using SEUCK - the plan is still to try the different game making programs and report back on them at the end of the process. 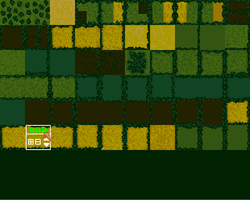 I have now created the majority of the game background sprites. 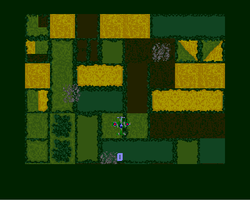 The screenshots below show a selection of the blocks in the background editor and the first screen in the background map level editor. 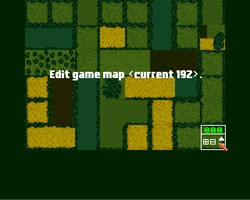 The Background level editor - the map is starting to take shape. A collection of the different background tiles for Battle of Britain. As well as completing the majority of the background - I have created the main player Spitefire sprite. This has changed from the original in that it now has two colour camoflague but annoyingly the propellor animation does not seem so effective - it is also frustrating that the animation setting are still slow even with no delay. 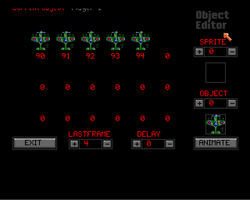 The main player Spitefire sprite starts to take shape - the propellor animation is proving rather frustrating. Now need to think about whether to start again with SEUCK which will delay this project by a month or move onto Backbone game creator. Have created the main spitefire sprite - using the non direction animation option as it allows for more realistic propellor animation. Drawback is I don't have banking movement when moving left or right. Completed death animation - quite a long piece of animation with smoke blowing out of the plane before it disappears into a smoke cloud - had wanted to include the plane discending to the ground in a tail spin - see if I can include this in enemy sprites. Biggest limitation encountered so far is the sprite colours - it should be 8 but in reality it is 7 as the first colour is used for transparency. Makes it very difficult to choose colours - looks like the enemy planes will have to be green as well instead of the grey as originally planed. Started to produce background sprites - trying to create a sense of depth and flying over the kent country side - looked at photo graphs of spitefires flying over farm fields - got a way to go before I am happy - but have a nice background sprite for a sheep field.